The Raiders will win all their games when they score more points than the opposition, and on the flip side will lose all their games when they score less than their opponents! I don't like that premise... moral victories are okay in my book! SARCASM! The Raiders will win all their games when they score more points than the opposition,( praise Gruden) and on the flip side will lose all their games when they score less than their opponents, (fire Reggie!) ! morality for the almost win!! Not sure if it helps, but certainly will rile the fire Reggie crowd! Hey that's what I usually go with. This time I thought for fun I would go ahead and make a prediction. In this thread earlier I went with 10-6. I am sticking with that as my prediction. I do think your's has a very good chance of being correct. 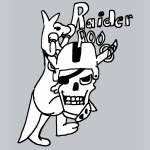 Raiderroo wrote Tue May 15, 2018 10:53 am: Hey that's what I usually go with. This time I thought for fun I would go ahead and make a prediction. In this thread earlier I went with 10-6. I am sticking with that as my prediction. I do think your's has a very good chance of being correct. His has a pretty low chance of not being correct. Probably the best chance of getting all my predictions correct! just saying! Raiderroo wrote Tue May 15, 2018 11:43 am: His has a pretty low chance of not being correct. Ha! we all know I'm right 99% of the time the other 1% is usually because I don't reply! With how I said it yes it sounds like there is a chance. In reality no there isn't.